Do you have enough time to do everything you need (or want) to do in a day? How to Make Love and Dinner at the Same Time is a fabulous slow cooker cookbook designed to give you more time to run errands, take a nap...or maybe even make love. Rebecca Field Jager discusses the advantages of the slow cooker method of cooking: it's ideal for warm days, as it doesn't heat up the kitchen like the oven, the slow cooker doesn't use as much energy or fat, meals can be prepared the night before, and it lets your family eat on your own schedule. Guidelines for choosing a slow cooker (known to many as a crockpot), how to use it, and maximizing the different ingredients are outlined. Recipes are divided into three categories in each section: WhamBam -- which use three or fewer ingredients, have a less than seven minute prep time, and require the use of no other appliances, QuickEase--use four or more ingredients, take less than 20 minutes to prepare, and require the use of a slow cooker only, and 33-Minute Recipes--the longest time it takes to make any of the other recipes. Looking for a variety of recipes? 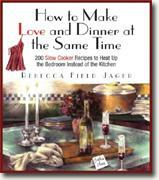 How to Make Love and Dinner at the Same Time has many different types, from simple to gourmet. In Appetizers and Dips, you can make (just to name a few): Warm Bean Salsa, Fiery Artichoke-Zucchini Spread, Brie with Red Pepper Jelly in Grape Leaves, and Pizza Roll. Soups range from French Onion to Mellow Yellow Corn Soup with Saffron. Main courses include standards such as Beef Stroganoff, Beef and Vegetable Stew, Sweet-and-Sour Pork, as well as unique recipes such as Lamb Chops in Tomato-Oregano Sauce, Caribbean Chicken, and Chicken Mole. There are many others--fish, seafood, and vegetarian dishes to please everyone in your family. Other categories: side dishes, beverages, and desserts give the reader plenty of choices. Mingled with the recipes are helpful hints and funny anecdotes that make the reading of the recipes almost like a novel. I personally tried the recipe for BBQ Pork Roast and it was exactly as described. A QuickEase recipe, it was simple to put together and delicious to eat. The recipes are clear and easy to follow. Even the most discriminating of palates will find something to please in this cookbook with a unique spin on slow cooking. If you haven't dusted off that old crockpot in a few years, dig it out of the cupboard and think of it a bit differently--it can give you some extra time to add some fun into your day.